After some years off a little blunder ("Till We Have Faces") and a short foray into the classical realm ("Momentum"), HACKETT came back with a wonderful album that contains some highly polished material. Perhaps it's a little over produced (a better balance was attained on "Darktown") and that is why I have only given it 3 stars; but it does contain some typical HACKETT rockers with soaring guitars such as "In the Heart of the City" and "Little America". There are also some beautiful instrumentals like "Sierra Quemada" and "Walking Away From Rainbows" (I always think of this one as "Horizons" with a fuller texture), as well as some moving ballads such as "There Are Many Sides to the Night" and "Dark as the Grave". As usual, STEVE's guitar never really steels the show; rather, he incorporates just the right amount of solo play, so as to sustain an overall symphonic feel to his material. The musicianship on "Guitar Noir" top notch and the lyrics interesting, not to mention quite amusing at times (check the ones on "Little America" for a laugh). 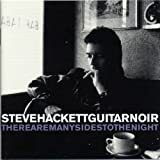 In the words of the official Steve Hackett website, "Guitar Noir is an album which highlights the shaded corners of the instrument - at times sombre, occasionally hilarious, but ultimately filled with lyrically intensive observations about the condition of the unsung majority". Released in 1993, "Guitar Noir" certainly paints some diverse and interesting pictures. The track order on the cassette version I have is somewhat different to the CD version. This results in the opening tracks being generally softer and more atmospheric, with the later ones having a harsher edge. Tracks such as "Take these pearls" and "Dark as the grave" have a symphonic feel, with the latter including a choral section. The former has a Pink Floyd feel, mainly due to the vocal style Hackett adopts. Steve's distinctive lead guitar style is in evidence on many of the tracks, such as "Paint you picture", "Sierra Quemada", and "Dark as the grave being". On the cassette version, three similar tracks, "Little America", "In the heart of the city", and "Vampire with a healthy appetite" appear consecutively. This is unfortunate, as they are among the least inspired on the album, at times being little more than bland pop rock. It still puzzles me as to why with Hackett's vast back catalogue, he selected "Vampire.." to represent his solo work on his "Tokyo tapes" album. Elsewhere, there's delicate acoustic/Spanish guitar, and some excellent keyboards work at times, such as the piano on "Tristesse" (the only track which Hackett did not have a hand in writing). "In the heart of the city" includes some train running information announcements, nostalgic for anyone who has experienced the delights of commuting in London! A decent album from the prolific Hackett, with some inspired moments. It's not all top notch though, and thus requires the listener to ensure they have a remote control available to "skip" where required. The songwriting and performances are up to the usual high standards. So what's the problem? The production/sound quality comes across as........"canned". Don't get me wrong. I love reverb, and I can even take that mid-80's "sheen" that nearly ruined hundreds of otherwise great albums during that period. But this whole album was recorded or mixed or mastered with some kind of system that just makes everything sound sterile and artificial. The drums have no "right in front of you" punch, which for me is really hard to get past. Now that I think of it, many of Hackett's albums employ too much of various "sweetening agents", especially his otherwise magnificent acoustic efforts. I just finally decided to sell this one. I rate this album as one of Steve's best. Very atmospheric, with a good mix of acoustic and electric guitar, the mood is quite dark at times, with the usual touch of humour and irony. I have the snapper 2 cd version, which comprises this album and There Are Many Sides To The Night, the live one. Both are excellent. My version doesn't have the last four tracks on it. The track running order was different when this album first appeared, I know this as a friend of mine has the original. 'Take These Pearls' was track one, whilst 'Sierra Quemada' was half way down the list. This last mentioned track is one of the best electric instrumentals Steve has ever written - it is simply beautiful, and I never tire of hearing it. I would even rate it above 'The Steppes' and 'Twice Round The Sun', both of which are, themselves, classics! But every song here has something to offer. 'Take These Pearls', 'Dark As The Grave', 'Paint Your Picture' all have exquisite melodies and the most wonderful harmonies, always a strength of Hackett's. 'There Are Many Sides To The Night' is lovely, with poignant lyrics, whilst 'In The Heart Of The City' has a superb keyboard solo to end it. 'Tristesse' effectively merges Steve's two guitar styles - classic and electric. But every song on here is worth listening to. A special album, and, as I said before, one of his best, easily up there with Voyage Of The Acolyte, Spectral Mornings and To Watch The Storms. And all his classical guitar albums. Wonderful stuff! This is not an essential album by the guitar maestro Steve Hackett. Steve Hackett has earned a reputation for being one of the most gifted composers - not only guitarist. His name came out when he joined Genesis in 1971 and contributed to the making of early excellent Genesis albums. He started his solo career with "Voyage to The Acolyte" while he served his tenure with the band until 1977. Since then he produced many excellent albums. Some tracks featured here includes those which have been live stage favorites e.g. "Sierra Quemada" or "In The Heart of The City". One thing that makes this album was regularly played at my CD player: the appearance of dynamic drummer Hugo Degenhardt which creates a special atmosphere of the album. His drum playing is different with other drummers and I guess he is one of the best prog drummers. I have no idea as what groups or musicians he has been collaborating so far but for sure he is great. Musically this album offers a stream of music where Steve Hackett blends classical music with rock and pop music. Some guitar work Steve plays in acoustic setting lend itself in a style where he has built since its first solo album. It's a good album to have especially for those who like Hackett's style. Keep on proggin' ..! I am by no means a connoisseur of Steve Hackett's long and diverse career, at least not beyond his groundbreaking work with early GENESIS and later his first few solo albums. So the chance discovery in my local public library of this 1993 release offered me a golden opportunity to become re-acquainted with a musician always near the top of that short list of truly innovative rock guitarists. Hackett has always been something of a musical chameleon. But even allowing for his admirable habit of changing color from album to album, it's hard to know what to make of this set: a collection of (mostly) bombastic, radio-friendly wannabe singles by an artist who apparently didn't learn his lesson from the aesthetic debacle of GTR (alongside a likewise embarrassed Steve Howe). Certainly Hackett has earned every right to rock out whenever he wants, but the AOR anonymity of this effort, together with a digital pile-driver production job, rarely plays to his strengths as either a composer or a performer. This is clearly a musician more at home in a strictly instrumental setting, as heard in the song "Tristesse" and in the simply gorgeous "Sierra Quemada". The latter in particular is a showcase for his trademark guitar work at its richest and most emotional, revealing (and not for the first time) exactly what Genesis lost when they let him get away. But elsewhere on the album the typically limpid sound of his classical guitar (always a Hackett specialty) is all but spoiled by his inadequate skills as a lead singer. While listening (for example) to the half-whispered elocutions of "There Are Many Sides to the Night", I kept wishing for a way to somehow isolate and eliminate the histrionic vocal track, leaving only the lush background of guitars and electronics. Compare that to the unadulterated beauty of the subsequent "Walking Away With Rainbows", the third of the (all-too few) purely instrumental selections on the album. I have to wonder who the intended audience for this disc could have been. Discriminating Progheads and fans of Hackett's best work ("Voyage of the Acolyte", "Spectral Mornings") might try to defend it out of partisan loyalty, but newcomers aren't going to be easily convinced. Let's hope that like a lot of his projects this was only a passing fancy; Hackett has too much musical integrity to be caught treading such shallow commercial waters. Steve Hackett enters the 1990s with an album that mixes all the styles he's worked with thus far into a cohesive work overall, but that doesn't spell greatness. Guitar Noir is a pretty solid album, albeit wrought with a few pieces that are just a smidgen below par. Despite that, it yielded some of Hackett's strongest instrumental material as well as a live classic in Vampyre With a Healthy Appetite. The album has a nice mix of acoustic and electric pieces, instrumentals and vocal laden tracks, and they're not too clustered or too far apart from each other. There is a nice spread of each throughout and there's a cohesive feel overall. Pieces like the opener Sierra Quemada are classic Hackett instrumental material with Hackett laying out melody after melody and solo after solo with a solid backing array of musicians. In the Heart of the City explores grim textures and solemn acoustic music with ethereal vocals from Hackett (this is the album where he began to find his feet vocally). One of my favorite pieces on this album is the classical piece Walking Away from Rainbows, which is a very moving passage of classical guitar and keyboard (from Julian Colbeck) and explores feelings not expressed since that of Bay of Kings (if even that, in my opinion). And finally, rollicking vocal pieces like Vampyre with a Healthy Appetite explore many different avenues, this one in particular shows Hackett experimenting with voice modulaters (to give his voice a much deeper sound). This song would also show what Hackett would go for in a way on To Watch the Storms. Guitar Noir may not be Hackett's best album, but it yields some highly creative and fun pieces as well as songs that woulld continue to show up in his live acts for years to come. Not a bad album at all. Stever Hackett, the man who needs no introduction, comes back to the scene with this soild album. To me this album serves as a great bridge from his seventies and eighties works to his modern day gems. A style is here that gets fully introduced in Darktown, perfected in To Watch The Storms, and continued in Wild Orchids. This just shows how Steve wasn't afraid to progress and change his sound, and that can't be said about many musicians, at least not in the degree that it applies to him. First and foremost, the instumentation on this album is fantastic. Once again, Steve pounds out awesome solos, beautiful melodies, and inspirering arrangments. Also, the feel of this album is very varied. Songs like "In The Heart Of The City" are dark and make you feel uneasy, while songs like "Sierra Quemada" express the true beauty of music. And for me, thats one of the qualities that Hackett has in true form: the ability to shift of the mood of the album without having it feel too chaotic. All the other musicians are in top form as well, really giving this an accomplished feel. The only downside to this record is, at one point, things get a little down and too calm for too long. Songs like "There Are Many Sides To The Night" go on too long, and songs like "Walk Away From Rainbows" and "Paint Your Picture" don't go anywhere fast. But the strength of the majority of the songs saves this one from being a record to skip. All in all, this is a solid record. Fans of Hackett's older and newer material will be albe to find something they enjoy in this album. However, this is not a beginniers album. 3.5 stars. Steve and I embarked a difficult relation once he released "Cured" in 1981. If you would except his good live album "Time Lapse", there were no real highlights any longer. The opening number from "Guitar Noir" is just beautiful. An hymn to melody. Those uninspired years seem to be an old story. "Sierra Quemada" is a great instrumental track (but this is how I like his work best). Way off his dubious experimentation of the last thirteen years. Because Hackett is so diverse that he is able to please (or not) different type of audiences. What I like form Steve, and I've told him frequently, is his great and symphonic approach of prog music. When I listen to the wonderful intro of "There Are Many Sides To The Night", I can only take my hats off. This piece is one of the most elaborate of this album. One goes from the most aerial mood to some emotional Spanish guitar sounds of the best vein. But as a critic, and we agreed to this Steve : your vocals didn't improve. You should really take care of this. Please. Those delicate moments would only be grandiose if . I am not a very demanding fan. Provided that some interesting musical parts are featured in one of your song, I'm more than pleased to praise it Steve. Even if like during "In The Heart Of The City" some weird vocals could have been avoided. Same comment for the nice and atmospheric "Dark As The Grave". Still, the whole of this album is not a wonderful voyage. There are some reminiscence of less glorious AOR days ("Lost In Your Eyes" and "Little America"). Avoid these songs in the future which are real bad. But the rest of this album is disappointing. Not only vocals are below par, the quality of the songs is very average. And one can hardly say that Steve is over-producing. Six years is well enough to come back with a solid album. But this is not completely the case, unfortunately. To compensate, there is of course the sublime "Walking Away From Rainbows". A jewel of a melody and probably one of his most emotional piece of music. Fortunately, this album closes as pleasantly as it started. But for different reasons. While "Vampyre" is a great and fully Crimsonesque song which features a very bizarre and scary atmosphere (hence the title) the atmospheric "Tristesse" (sadness) is closing this album on a more tranquil mood. "Guitar Noir" is by far Steve's most symphonic work for ages. And I like it. Three stars. If I was asked to recommend something by Steve Hackett I would definitely go for one of his excellent, recent live DVDs: Somewhere In South America or Once Above A Time. But if I was specifically asked to recommend a studio album by him I would probably choose Guitar Noir (or possibly To Watch The Storms). None of Hackett's previous albums did encompass every aspect of his musical persona; Classical, World Music, Folk, Blues, Jazz, Pop and Rock (not much Symphonic Prog here, though). All these styles have never been so perfectly moulded into one organic, unified whole as here! It is no masterpiece of progressive music, but it is a very personal musical statement by one of Prog's most interesting people. This album perfectly captures what Steve Hackett is all about (as a solo artist). And, in my opinion, this is one of his best ever solo albums. Overall, Guitar Noir is a more consistent album than Voyage Of An Acolyte and Spectral Mornings, that I think were a bit disjointed and uneven (even if they both feature some excellent tracks). Here, Steve sings all the songs himself, and he has really developed his vocal abilities since his early albums. I think he is a wonderful vocalist here! The absence of guest vocalists really helps to give the album cohesion and a sense of direction, and a strong musical identity. The album has a good balance between instrumental and vocal material, between acoustic and electric, and between mellow and not quite so mellow. Guitar Noir is diverse and eclectic but the mood is basically the same throughout its many different styles; the mood is simply "Noir". A mood he tried to recapture on his subsequent albums. In that sense, Guitar Noir can be seen as the start of a new era in his career, the 'noir'-era. Guitar Noir is quite soft but there are some rockier moments like In The Heart Of The City and the Blues rocker Lost In Your Eyes that keep the album from ever getting boring, but nothing at all that rocks hard though. The guitar work is fantastic and very distinctive. Steve's vocals are better than ever and the album is very well produced. I'll give you a challenge. Dim the lights. Lie down on the floor. Relax. Listen to Walking Away From Rainbows. Now try to get up. It is absolutely impossible! This is possibly the most relaxing and beautiful guitar piece I have ever heard. It could stop a war! Sublime! Sierra Quemada has a South American feel to it. I think Sierra Quemada is a very old calendar somewhere in South America(?). Vampyre With A Healthy Appetite stands out as the only humorous lyric here. Musically the song has the same structure as Darktown (but jazzy), with Steve "talking" the verses instead of singing them, using his darkest voice. Funny and a bit scary at the same time. One of Hackett's finest hours and an excellent addition to your Hackett collection! It had been said that Genesis lost its brain when Peter Gabriel left, and its heart when Steve Hackett left. While the remaining 3 members cavorted towards Oz like the Scarecrow, Tin Man and Lion, "Spectral Mornings" might be the musical heir apparent to "Wind and Wuthering". "Voyage of the Acolyte" and "Please Don't Touch" were more like solo projects that availed themselves of hired hands, but in this 1979 product, the Steve Hackett band debuts with both swagger and modesty. The richly atmospheric keyboards of Nick Magnus, the chunky bass of Dik Cadbury, John Shearer's sympathetic drums and brother John Hackett's expressive flute all converge with some of Steve's most definitive guitar work. "Everyday" begins as an organ based soft rock number, but fission occurs when Hackett cuts loose for the last half, unleashing a solo that would form the blueprint for neo prog histrionics from MOSTLY AUTUMN to COLLAGE. The rich accompaniment is as important as the main player, even if he slips in a near impossible sequence around the 5 minute mark. "The VIrgin and the Gypsy" immerses us in pastoral fantasy, and here it is John's flute that propels us skyward while Nick Magnus' harpsichord provides a bed of soft leaves for reentry. Dik Cadbury's vocal lead and the unison harmonies are sensitively arranged to the minutest degree. From here, "The Red Flower of Takai" is a decidedly Eastern sounding instrumental, thanks to the koto, the melody and the arrangements, and it leads seamlessly into the much moodier and at times violent "Clocks". The group's attempts to recreate the spirit of the resplendent "Clocks" at several points, particularly "Tigermoth" and the title track, but with less success. Hence the rest of the album is good but simply not the equal of the first 4 pieces. Some of the faux music hall vocalizing in "The Ballad of the Decomposing Man" is ill advised, while the singing in "Tigermoth" is similarly limpid. The best of what remains is "Lost Time in Cordoba", a meandering neo flamenco meets classical arrangement that works for active enjoyment, study or meditation. Thirty years on, "Spectral Mornings" has stood the test of time like no mere apparition, and is one of the most consistent works by a man with often incongruous tastes. I have this album as a low-price Snapper Music's double set with There Are Many Sides To The Night (live 1994). Well worth the money! 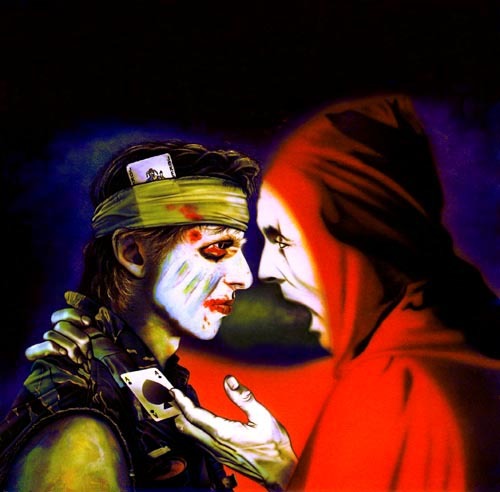 In general, it is safe to say that Hackett has never done as strong albums as in the seventies; his later albums often suffer from some kind of identity crisis, in the same way as Steve Howe's. He likes to show off his interests in various music styles, and also usually chooses to sing himself instead of having guest singers as often was the case in the seventies. And frankly Steve isn't any great singer. This one, even if guilty of the mentioned things, is quite an enjoyable pop/rock album with delicious electric guitar playing. You hear some blues with associations of rainy cities at night, you hear some Latin American influences, you hear layers of keyboards (Julian Colbeck and two others), etc. There are some tracks that rock slightly harder but the overall athmosphere is dreamy, emotional, nocturnal. Guitar Noir is indeed very fitting title to this album! As some reviewers have already said, the album is dragged down a bit with tendencies towards AOR (remember GTR, Hackett's and Howe's collaboration in the eighties?). Some tracks are really best to jump over, but with as many tracks as 13, a few worse songs are still easily forgiven. Here's a lot to enjoy. Also Hackett's singing is relatively better than on some other albums. Steve Hackett´s first entry into the 90´s is a quite good work. I think Guitar Noir sounds better than most of his 80´s stuff, but by no means is superior to what he has done in the beginning of his solo career. As usual he has done a fair amount of terrific songs with others not as great. Although this CD has some kind of unity, the use osf several different musical styles throughout the album makes it sound uneven and unfocused. What I can really say is that he has mastered his vocal habilities like very few other legendary guitarrist have. Ok, he does not have a great range, but he has a fine tone and has developed his techniques on it a lot. He is - Gabriel and Collins aside of course - the best ex Genesis member to handle the vocal department. The CD starts very well with Sierra Quemada, a great instrumental track, one of his best. Take this Pearls and There Are Many Sides To The Night keep the high profile, specially the latter, with some real fine guitar lines only Hackett can do. In The Heart Of The City and Dark As The Grave may not be as good, but is still ok. The main problem is the sequence Lost In Your Eyes and Little America. A couple of real weak songs, the former with an odd mix of AOR and blues rock and the latter just a bad AOR tune. Those two songs ruin the record´s balance. The remaining stuff is good, except for the whimsical Vampire With A Healthy Appetite, one of Hackett´s typical tunes that always seem to plague his records. It sounds like a poor joke, but he might have taken it seriously for it appears on his live DVD Tokyo Tapes (its inclusion in this otherwise excellent show is beyond my comprehension). Overall I think Guitar Noir is a very good album, very well done and does have a good dose of Steve Hackett´s brilliant guitar playing. Aside from those aforementioned problems, this is a pleasant album and a good sigh after several less interesting works of some years before. 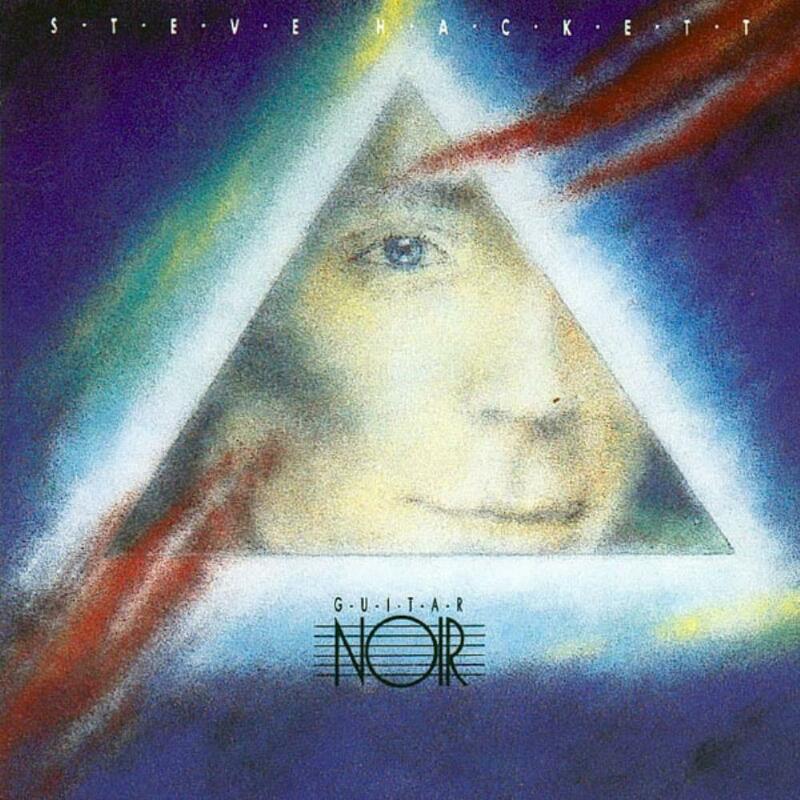 Guitar Noir is one of the better electric and symphonic albums in Steve Hackett's discography, in my opinion. The music overall has a highly symphonic progressive rock sound, but also has a very strong new-age feel with synthetic tribal percussion and droning melodies in the back of the mix. There is a lot of beautiful classical guitar playing as well as fine electric playing by one of the masters of progressive rock guitar. The soundscape found on this album are very soothing, and as I said before, quite influenced by new-age music with maybe a touch of smooth jazz. The music does occasionally come off as sounding like above-par elevator music with more interesting passages, but if you enjoy mellow music with fantastic soundscapes accentuated by terrific guitar playing, then this is definitely for you. This is the perfect mediator between Hackett's symphonic records and his classical records. If this is a "comeback" album, then it's a disappointingly predictable one. One of the prominent features of the late 80s and early 90s in rock music was the regular release of "return to form" albums by artists originating in the 60s and early 70s, where the albums weren't actually very good but where everybody was just so relieved that they were abandoning 80s production techniques that nobody really cared. Guitar Noir, unfortunately, fits very well in that category; all of the experimentation (for better and for worse) since 1980 has basically been abandoned, and the album is a very straightforward collection of melancholy instrumentals and melancholy "normal" songs. The songs are never worse than decent, and Steve has fully grown into his voice (he sounds a lot like late- period David Gilmour in spots), and the sound is very guitar-centric, but it's very difficult to sit through an hour of this kind of sound. There is, of course, some material that I enjoy a lot. The opening instrumental "Sierra Quemada," originally titled "Flight of the Condor," is a fine addition to the list of solid guitar- based Hackett instrumentals; the tasteful synths, the slightly intricate drumming and the minimalistic guitar parts make for the most majestic (not necessarily the best, but definitely the most majestic) Hackett piece since "The Steppes." Of the "normal" songs, I'm especially partial to "Lost In Your Eyes," which starts off sounding like it will be unbearably cheesy (largely thanks to the synth line), but it quickly turns into a pounding harmonica-driven rocker, and so help me I just can't resist the "I see a world lost in your eyes" line at the end of each verse. I guess typical Hackett fans wouldn't like this, but if this had been on, say, Voodoo Lounge, this would have been beloved by a lot of people. Some other songs have some nice features that make them stand out, too. "Take These Pearls" is the closest the album gets to looking back to Faces, initially centering around an intricate Eastern-sounding xylophone/vibe bit (probably synthesized, but whatever), before breaking out an interesting vocal melody that gets mirrored by acoustic guitar at one point, and eventually culminating in some nice bits of guitar synth. "In the Heart of the City" is the most desperate-sounding song on the album, and while the more upbeat portions are a little jarring, the bulk of the song works for me. The closing instrumental, "Tristesse," makes for a fairly moving finale, based around descending lines and covered in lovely guitar parts, though its impact is fairly muted by not differing hugely in tone from everything that came before. And really, I just can't escape the sleepiness brought by most of what came before. The goofy, overblown dark "rocker" "Vampire With a Healthy Appetite" isn't really that good of a song, and it's got an incredibly silly attempt by Steve to sound menacing, but it's such a relief to have some levity that I find myself enjoying it more than a reasonable person should. Everything else is perfectly competent and moody and, for the most part, perfectly tasteful, but it goes overboard on good taste and moodiness in a way that makes my mind register it in much the same way it would register smooth jazz. That's not a compliment. Again, nothing on here is bad in the same way some material on his 80s albums was bad, and the material reaches some terrific peaks, but while this is a reasonable re-entrance to the world of "normal" albums, this wouldn't have been a good new direction for Steve. Fortunately, I think he knew this too; while it would have been very easy for him to start churning out albums in this vein, he was just a little too restless for such a thing to happen. Post a review of STEVE HACKETT "Guitar Noir"